I feel like it's been so long since I was here, but it's not even been a week. It's because we had several days of rain so I spent the time signing and addressing birthday cards from my stash for the upcoming weeks rather than making new ones. That always a great accomplishment, but it wasn't all fun and games because there were taxes to be done. Oomph. That takes the Zwah D. Veeve right out of a girl! And suddenly the week whooshed by! Whatever you did this week, I hope it was excellent! If you're a long-time friend here, you know I inherited dried flowers from my friend and neighbor many years ago. She picked the flowers and pressed them herself and I treasure them. I've made cards with them before, but it's been quite a while since I had a play so it was fun to work with them again. The window frame and window box are from Poppystamps. I slid a piece of blue vellum behind the window to add a little skyish interest. The flower stems slid easily into the window box and a dot of glue holds them in place. The sediment is from MFT. Isn't that a great photo for spring?! It's also a great photo for those of you LONGING for spring and still seeing snow outside your window instead! Don't look! 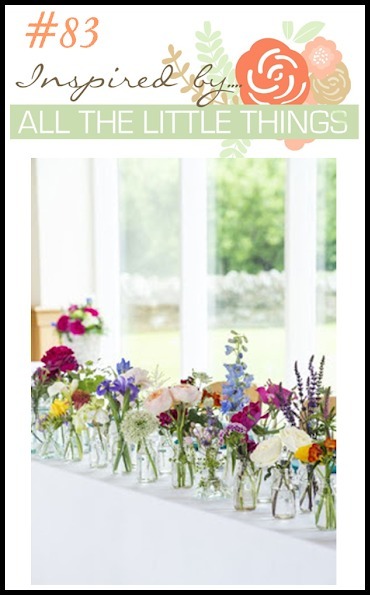 Instead, cast your eyeballs on the photo and notice all the many little ways you can be inspired by the sweet lineup of flowers! Hmmm? Feel a spark of a card idea? I'm pretty sure you have a stamp that looks just like that one right there, or maybe the one on the end? Or several? I hope you'll be inspired by the photo and join us in the challenge! My talented friend Cat Craig of Cat Luvs Paper is joining us for both challenges this month as our Featured Artist. You will find Cat's beautiful card and the gorgeous cards of the talented Design Team over on the blog! Always Fun Challenges: Happy Birthday. I'm going to leave you with just the Onefer today! Wait. What? Feel my forehead. Am I okay?! Yes, never fear, I'll be back on Tuesday with my Twofer Twofer! What a lovely card and genius idea using dried flowers! It's just perfect for the sweet inspiration photo you chose. A breath of spring for me here on the east coast since we just got more snow yesterday. Thanks for the ray of sunshine Darnell! Gorgeous! Look at those pretty flowers. Who wouldn't be inspired by that photo. Your card is absolutely lovely. Thank you for sharing. Glad you are getting some rain. Hope it's not too much. That Mother Nature doesn't know about moderation it seems. We had light snow falling most of the day yesterday, opening day for our baseball team. Haha! The boys of summer might have been a wee bit cold. Can't complain too loudly as we have barely had any snow all winter. We need the moisture, badly. Back to the card. Lovely sky with the vellum. Lovely window, too. Have a wonderful and hopefully dry weekend! Hugs! This is such a cute card Darnell, so clever and inventive. Plus... it's a cheery, feel-good kinda card and we all like those. Beautiful. When I first looked at the card, I thought wow those look like real flowers. Then I read the blog and discovered they really are. How do you keep the flowers from falling apart? I've never had much luck with drying flowers. Breathtaking beautiful! I do love those dried flowers and they seem to be the perfect size for the little window box. Gorgeous! Darnell, your card is a FABULOUS interpretation of the photo. The dried flowers are so pretty. Very brave my friend. Thank you so very much for the invitation. This is simply amazing. I like it, tht you have used dried flowers instead of paper ones! Oh this is so pretty! Great take on the photo! Would love to see those blooms sticking out from my window but, as you know, the rain in Spain moved here so all I see is wet and puddles. What a pretty card. Love window boxes, they harken back to sweeter era, and this one is one of the prettiest I've seen. Hope you didn't drown in the overnight deluge, my friend. It's a fabulous cad! These dried flowers from your dear friend look amazing on the window shape! My dried flower haven't these lovely colours ! Hi Darnell, Loving the card. The dried flowers are so pretty and look wonderful in the window box. I love the vellum panel behind the window too - very clever of you to think of doing that! Wishing you a warm and wonderful weekend! A beautiful card and such pretty dried flowers too. Oh wow that is one cool card Irma. Wonderful card. I love the window box with all those gorgeous flowers in it. This is truly amazing! FABULOUS! You sure are putting these beautiful dried flowers to great use! Yes I love the inspiration photo ... hmmm wonderful if I have time to join in the fun?? LOL Hope so! Thanks for beautiful inspiration and hope you're having an awesome weekend! Exquisite! An absolute stunner full of colourful beauty Darnell. Gorgeous card Darnell, brilliant design and those dried flowers look fabulous, very classy creation. Your window box is lovely, Darnell! The dried flowers look amazing! What an awesome gift to inherit from your neighbor! Darnell! Your card is absolutely STUNNING!! I love that you used dried flowers in your flower box. Such a gorgeous card! Oh what a feel good spring time card - now if Mother Nature would just get her act together. We are "expecting" some more snow tomorrow - ok think positive this will be the last one. Love the flowers and oh my just onefer this time. I do remember your neighbour and friend and it is wonderful to see you use those gorgeous dried flowers again - your window box is absolutely delightful and makes me wish Spring would finally arrive! It is a truly beautiful card Darnell. I LOVE your use of real dried flowers instead of a flower stamp or die - they are beautiful! And they fit perfectly into the window box. A gorgeous card! p.s. It's rained here in Vancouver most of the week too! I'm started to turn moldy! Wow, Darnell, what a gorgeous springtime card! The dried flowers are beautiful! Your window box of dried flowers is gorgeous, Dolly! 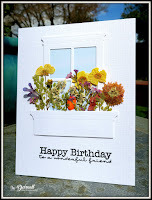 The blue vellum behind the window is perfect to add a beautiful background for these flowers! This is beautiful, Darnell! Loving those dried flowers...so pretty! Your pretty card brought back memories of when I first started making cards. I used to dry my own flowers and use them on my cards. They were never quite as vibrant as yours. Not sure if it was because I chose the wrong flowers or if my drying method wasn't quite up to par. Thanks for reminding me. I should look in my flower press and see if there are any still lurking there. We also have rany days and clouds.. This is a beauty Darnell! I just love the dried flowers in the windowsill, and love the blue vellum window- nice look. Wonderful card! A breath of Spring in this chilly April! I love cards with natural plants. Your window looks stunning, Darnell. I love how beautifully you planted flowers, you are a great gardener :-). Thank you for reminding me of my supply of dried plants. Beautiful!! Love the window flower box! Those dried flowers are perfect for this inspiration picture. They are preserved so beautifully. I always wait till the very last minute to do taxes. I just hate getting everything ready to take. For some reason I had this past Thurs. on my mind, so my bad. Heck, I could almost think this was a picture of your own home! In fact, if you scroll a little too quickly it does appear this is a garden post, rather than a stamping post. Beautiful card, beautiful sunshine! Love, LOVE it! The blue vellum is pretending to reflect the sky. I'd have to use gray. Nice to have gotten those taxes done, yay! Great idea to back the window with blue vellum--gotta remember that! The straw flowers are beautiful--what a great card, Darnell! I know what you mean about the signing & addressing not being the fun part. Don't know how you do so many! Enjoy your week, Greta PS--Cat is a great choice for GD! How gorgeous is this and great idea with the blue vellum! What a lovely boo-kay of poisies. I once wanted to get into dried flowers but came to my senses. Where would I get them from? Steal them from the floral dept?! I used to work with dried flowers eons ago, Darnell, although I made pictures instead of cards. They look wonderful in your window box. Love how the real flowers look on the card - this is absolutely perfect for the inspiration! What a treasure to have in those sweet little dried blooms from a friend. This is ever so lovely Darnell and has me longing for warm weather! What a beautiful card Darnell - Love those dried flowers, which reminds me I have a stash of dried bits somewhere in my studio - I must look it out! Wonderful take on the inspiration photo, Darnell! Darnell, I love you window box of flowers. So pretty my friend. How lovely your flower box is with the real pressed flowers sis! That's so nice to use these given to you by your friend! Awww, I adore your flowering window sill! Perfect take on that pretty inspiration photo! Such a lovely card, Darnell! The blue vellum is wonderful and the dried flowers so pretty. It reminds me sunny days will arrive soon! This is so darn cute and creative, Darnell! So impressed with your preservation and finding the photo to go with it! What a gorgeous card. Love the real flowers makes it even more special. Wow, I love this card. Those dried flowers are really special. 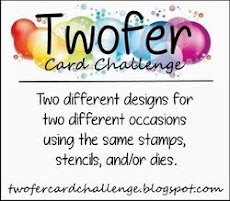 Darnell, this is such a brilliant take on the inspiration challenge...love it! Love how you have used your precious flower gift on this gorgeous card Darnell, made a very special card. Oh my word!! This is so lovely. What a treasure to have these pressed flowers. 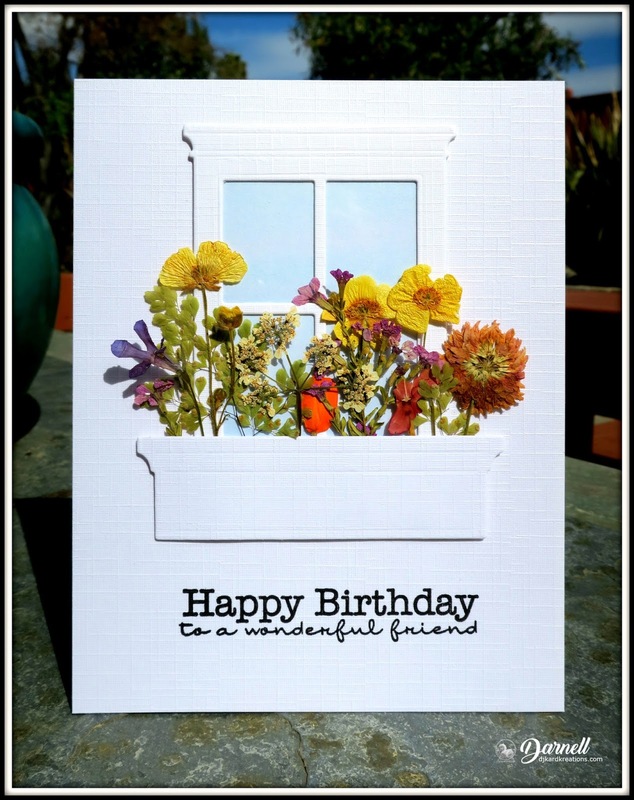 I love how you created the window box and that sentiment is so pretty-love the font mix!! Oh this is stunning, Darnell! Truly gorgeous! 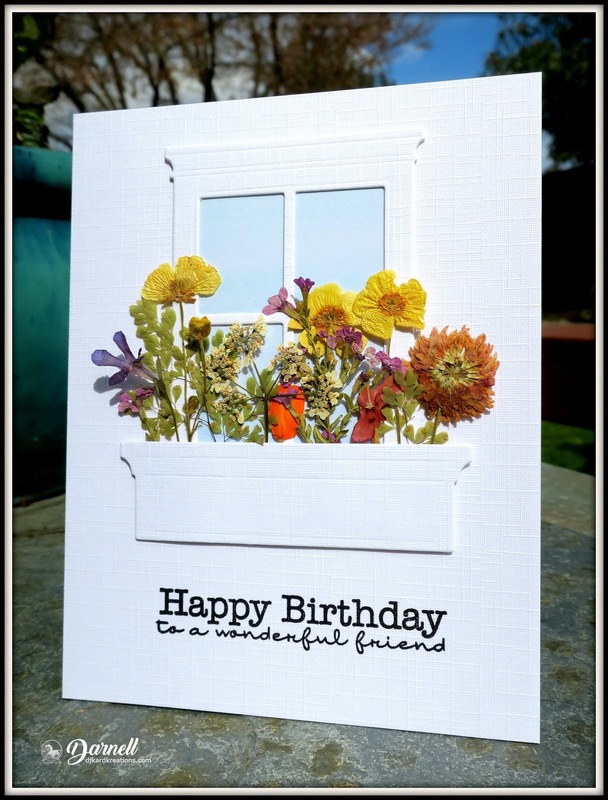 I am so impressed by the way you used those real dried flowers in your window box and am wondering how you managed to glue them to the card without making a mess? I dried some flowers years ago and still have them in a folder but am nervous about adding them to cards. I can just imagine the recipient opening an envelope full of crushed, dried petals, ugh. Super use of your friend's pressed flowers. 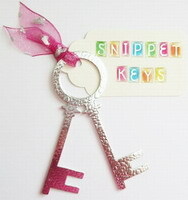 They are perfect for the inspiration this week! WOW! This is AMAZING! I love the dried flowers!! Thanks for joining us in the Poppystamps Framed Challenge! Love your use of the dried flowers in the window box! 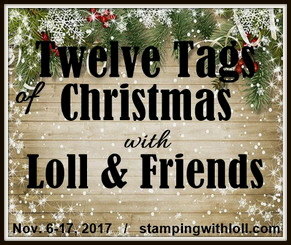 Thank you so much for participating in Poppystamps "Framed" Challenge! So happy I stumbled on this card by it reaching out and grabbing my attention!!!! Wow what a showstopper ...loving the dried flowers you used, Darnell! 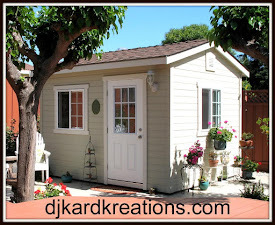 Simply gorgeous and brilliant idea!!! Oh WOW! Darnell! What a brilliant idea! I love the dried flowers in the window box! This is so pretty and fresh I had to look twice! I'm catching up again........or trying to lol!!! What a fantabulous card to showcase Rae's beautiful dried flowers. I'm sure that she will be smiling down approvingly on you.